(January 23, 2018 – Hong Kong) Ying Jee Club, the newly-crowned Michelin one-star Cantonese fine-dining restaurant, is delighted to launch its first ever Chinese New Year Puddings in celebration of the Year of the Dog. 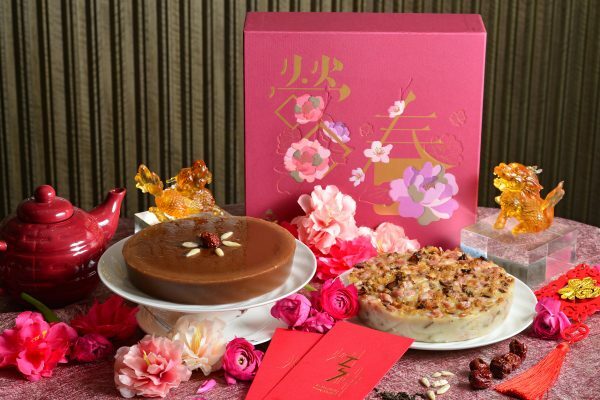 The newly created Chinese New Year Pudding with Coconut Milk and Ceylon Tea, and Turnip Pudding with Conpoy and Air-dried Meat are packed in auspicious gift boxes which symbolise the best wishes to a Year of Luck, Fortune and Prosperity. Chinese New Year Menus will also be available starting from February 1, 2018. A wide array of auspicious Cantonese delicacies will be presented, which is perfect for family and friends reunion during this festive season of the year. Meticulously handcrafted by Executive Chef Siu Hin Chi and his culinary team, the preservative-free puddings will be offered in 2 flavours. With a unique pairing of coconut milk and Ceylon black tea, the Chinese New Year Pudding with Coconut Milk and Ceylon Tea (HK$228 per box) adds a contemporary touch to traditional flavours. It has a tint of delightful Ceylon fragrance, yet not-too-sweet for the taste buds. The classic Turnip Pudding with Conpoy and Air-dried Meat (HK$288 per box) is made with rich ingredients including grated turnip, conpoy, dried shrimps, preserved Chinese sausages and Chinese bacon, creating luxurious layers of flavours. To place orders, guests can visit Ying Jee Club in person, call 2801-6882 or email to reservation@yingjeeclub.hk. Puddings are available for collection at Ying Jee Club between February 1-15, 2018. Gift vouchers are also readily available. Chef Siu has also created 2 choices of 8-course Chinese New Year menus (HK$2,288* per person/ HK$12,888* per table of 10 persons), which will be available between February 1-28, 2018. Each course exemplifies the highest standard of excellence in Cantonese cuisine, and conveys the best wishes to a year of fortune and success. Highlights include Braised South Africa Abalone with Sea Moss and Sun-dried Oyster, Stir-fried Lobster with Shallot, Red and Spring Onions, Steamed Tiger Garoupa with Bean Curd and Scallion, and Double Boiled Imperial Bird’s Nest with Coconut Juice.